Unfairly labeled a staunch traditionalist by baby-boom critics, Tom Petty keeps selling records to young folks because, like Neil Young, Petty can play in front of people half his age without condescending. 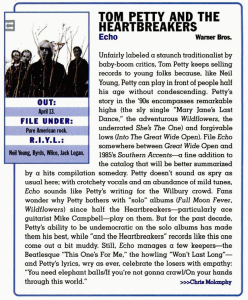 Petty's story in the '90s encompasses remarkable highs (the sly single "Mary Jane's Last Dance, the adventurous Wildflowers, the underrated She's The One) and forgivable lows (Into the Great Wide Open). File Echo somewhere between Great Wide Open and 1985's Southern Accents -- a fine addition to the catalog that will be better summarized by a hits compilation someday. Petty doesn't sound as spry as usual here; with crotchety vocals and an abundance of mild tunes, Echo sounds like Petty's writing for the Wilbury crowd. Fans wonder why Petty bothers with "solo" albums (Full Moon Fever, Wildflowers) since half the Heartbreakers -- particularly ace Mike Campbell -- play on them. 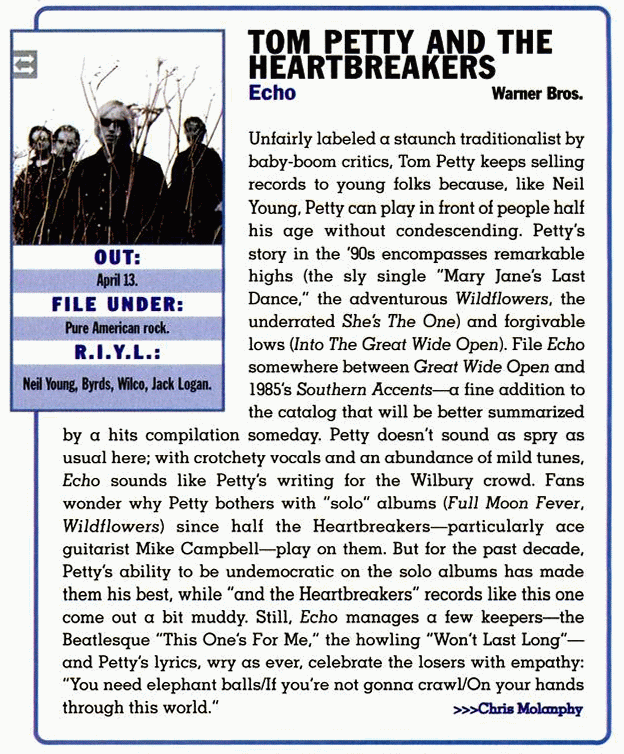 But for the past decade, Petty's ability to be undemocratic on the solo albums has made them his best, while "and the Heartbreakers" albums like this one come out a bit muddy. Still, Echo manages a few keepers -- the Beatlesque "This One's For Me," the howling "Won't Last Long" -- and Petty's lyrics, wry as ever, celebrate the losers with empathy: "You need elephant balls/If you're not gonna crawl/On your hands through this world."